Ms. Robertson is absolutely detailed oriented, organized and knowledgeable. She worked many angles and was always prepared in our meetings from the first time I met her to the dismissal of my case. 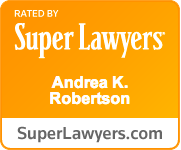 Andrea is simply the most caring, understanding, and professional lawyer in Seattle. I can’t express what she has done for me, tireless effort and expertise has yielded the best possible outcome and I am forever greatful for her representation. Best attorney ever !!!! Ms. Robertson - A breath of fresh air in a very predatory profession! No need to shop around for lawyers. Andy is the one you need.